"It's not just us, our lives. It's the life of our country." That quote pretty much sums up why the World War II thriller Passage to Marseille, while not a bad flick, fails to recapture the magic of Casablanca. Released in 1944, a little over a year after that all-time classic, this film features many of the same cast members, the same composer (Max Steiner), the same director (Michael Curtiz), and the same pro-France anti-Nazi viewpoint. However, it replaces the human romance at the core of that earlier success with a mad love for country. I'm sure this, in some ways, reflects the tenor of the times, but viewed now it's a little hard not to disengage from the story during the various moments where the characters stop resembling human beings and become two-dimensional emblems of patriotism. At the center of this unusually plotted story is a group of French prisoners who are found half-dead and floating at sea. After they are rescued by a freighter, it becomes apparent that this crew used their canoe to escape from the penal colony Devil's Island in French Guiana. For a good cause, though: they hope to return to civilization and join the war effort. Their leader, Jean Matrac (Humphrey Bogart), was a lefty journalist whose outspoken opposition to creeping fascism in his country got him framed for murder. The others -- wily Marius (Peter Lorre), strong and soft-spoken Renault (Philip Dorn), quick-witted Garou (Helmut Dantine), and the bear-like Petit (George Tobias) -- are not all as guiltless as Matrac, but they are presented to us as decent guys who made some mistakes. Hey, they all want to fight for their homeland and make it a democracy again, so they can't be so bad, right? (It must be noted, however, that with the variety of accents coming out of this multinational crew of actors, it takes concerted effort to convince oneself that these are all full-blooded Frenchmen.) The one-eyed Captain Freycinet (Claude Rains) thinks they're good guys, at least. Rains, dapper as always (even with an eyepatch), is our initial guide through what turns out to be Matrac's convoluted journey from rabble-rousing idealist to disillusioned convict to noble fighting man. Before you pitch a fit that I've just spoiled the movie, allow me to point out that when we first see Matrac, he is already a gunner flying with the Free French out of a secret base in the English countryside. Matrac's history plays out in the film essentially in reverse, through a series of anecdotes that characters tell to each other. Captain Freycinet tells a curious journalist (John Loder) of how he first met the convicts on that freighter that rescued them. Then, within that story, a convict describes to Freycinet what it was to be imprisoned on Devil's Island. Then, within that story, the convicts discuss Matrac's pre-prison past. That's right, we end up in a flashback inside a flashback inside a flashback. Many critics have complained about this non-linear approach, saying it makes the film unnecessarily confusing. I disagree entirely: this structure keeps the narrative fresh and mysterious, and it allows the characters to deepen in unexpected ways as the film progresses. Plus, the film plays fair with its conceit. It doesn't jump from flashback to flashback willy-nilly. We are eased gently and gradually into the past and then eased, step by step, right back out again. That said, this structure does have its flaws. The most glaring one is that the characters of Jean Matrac and his wife Paula (Michele Morgan) get less screen time than is probably necessary for their story to connect emotionally with the audience. Their romance is one of the main engines driving the story, but we have to wait until we get through three levels of flashback before we see them together and in love. Heck, it seems like it takes nearly half of the film's running time before we see Bogart take over a scene and do something. Up until then, he mostly sits tight-lipped and contemplative or meaningfully watching the men around him while smoking a cigarette down to its end. On the upside, this leaves plenty of room for the supporting actors to show their stuff. 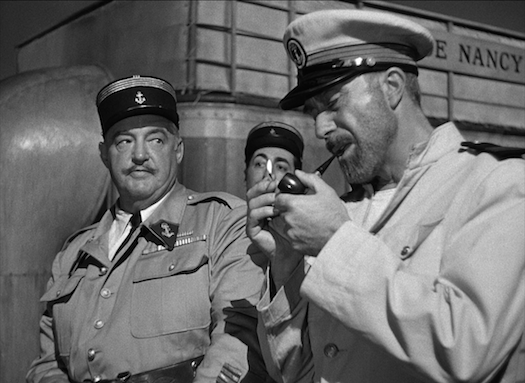 In addition to Lorre and Rains, Sydney Greenstreet also returns from Casablanca, this time as an insufferable army major with unfriendly intentions toward the patriotic convicts. 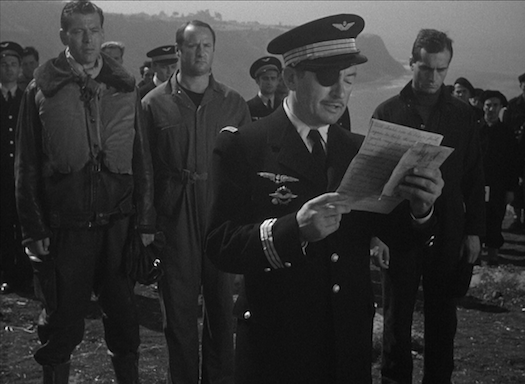 French actor Victor Francen exudes quiet dignity as the freighter captain who opposes the major. Vladimir Sokoloff is sweetly pathetic as an old man whose desire to leave French Guiana becomes the springboard for the convicts' escape. The strength of these characterizations point to the central difficulty facing the makers of Passage to Marseille: their film is most compelling when it highlights the camaraderie and humanity of its characters, but the main message being driven home is one of patriotism over humanism. 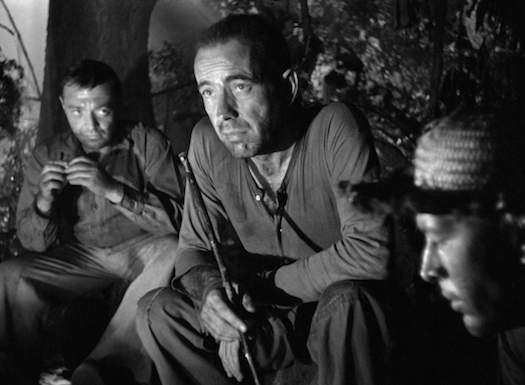 At one point, Bogart's character guns down three unarmed Germans as revenge after a casualty-heavy firefight -- and this is portrayed as a redemptive moment. Matrac becomes John Rambo before John Rambo, ready to blow the living hell out of any German who stands in the way of victory and a Free France. As cartoonish as those Stallone films got, Rambo's story has a tragic undertone. Passage to Marseille, on the other hand, has too specific of an agenda to explore the darker implications of this shift in Matrac, which is another reason why the film doesn't work as well as it did when it was new. Thanks to Curtiz's crisp, fat-free direction, Passage to Marseille remains engrossing throughout. The film's true MVP, however, is cinematographer James Wong Howe (Hud, Sweet Smell of Success). Howe's poetically wrought and often high-contrast images are breathtakingly expressive while still serving the narrative. If Passage to Marseille has any shot at all at being reassessed by future critics as a great film, surely the basis for this argument will be Howe's camerawork. Speaking of James Wong Howe's photography, this AVC-encoded 1080p 1.37:1 transfer represents a beautiful preservation of Howe's meticulous work. He occasionally uses deep focus when filming the five convicts sitting together and all five faces remain startlingly crisp. Film grain is present, but never overwhelms the image. The contrast is presented with nuance, allowing for significant subtlety in the shadows. The blacks are inky and rich. A few shots look a bit softer than the others but this is probably due to the use of opticals or an imprecise focus puller on the day. Apart from a newly struck print, it's hard to imagine this film looking any better. The DTS-HD MA 2.0 mono soundtrack has also been satisfyingly restored, although it has more inborn limitations than the visuals. The dialogue sometimes comes across flat and boxy, but it's always understandable. Max Steiner's score is more lushly presented and provides suitable emotional uplift. When we get into heavy battles scenes, the effects go bang and pow effectively. An English SDH track, with big block letters in bright yellow, is the only subtitle option. Uncertain Glory trailer (2:13) - The kick-off to a "Warner Night at the Movies" program intended to resemble the theatrical experience in 1944, here's a preview for a wartime thriller with Errol Flynn. Newsreel (0:56) - A brief profile of women in the armed services. I Won't Play (17:56) - A short film in which a blabbermouth Marine spins tall tales about how he used to be a big-deal piano player before the war, but when confronted with a real live piano, he refuses to play. Jammin' the Blues (10:15) - A stylish musical short featuring a few numbers from a jazz combo led by Lester Young, with vocals by Marie Bryant. The Weakly Reporter (6:41) - The "Warner Night at the Movies" closes out with a cartoon, in this case a mock-newsreel that's basically a bunch of blackout gags about wartime hardships on the homefront. The Free French: Unsung Victors (16:51) - A short documentary with historians discussing the underground fighters whose struggle inspired the film. Breakdowns (6:46) - One of WB's yearly in-house gag reels, showing various stars flubbing lines -- and cursing up a storm. Passage to Marseille is a solidly entertaining film, with good performances, an oddly structured plot, and gorgeous cinematography. The film's dogmatic patriotism overwhelms emotional logic in a number of scenes, which makes the film less believable and resonant than many other wartime dramas that have better stood the test of time. Nonetheless, this Blu-ray upgrade is excellent. Fans of this film need not hesitate: it is a must-own. For others, my response is slightly more measured: Recommended.